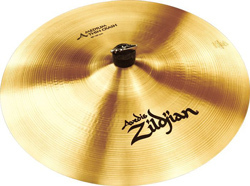 The Zildjian A Series Medium Thin Crash Cymbal is a bright crash with a stronger high-end than the Thin Crash. Bright, full-bodied and natural. Not too high, not too low, it speaks quickly with warm undertones. These are the cymbals that launched a million drum solos and shaped musical history. A Zildjians are the world's most popular and versatile cymbals, and for good reason. Splashes, Crashes, Rides, Hi-Hats or Effects, they all explode with a spectrum of tonal colors and excel in any musical setting. Created from a cast bronze alloy (80% copper, 20% tin, traces of silver).